To begin Eleanor Catton’s elegant, 832-page novel, recipient of both the 2013 Man Booker Prize and the Governor General’s Award for Fiction, is a daunting task. The Luminaries contains 20 important characters (helpfully charted in the opening pages), follows an astrological structure and is, as mentioned above, an intimidating 832 pages long. To settle into the opening chapter (“In which a stranger arrives in Hokitika; a secret council is disturbed; Walter Moody conceals his most recent memory; and Thomas Balfour begins to tell a story.“) is not a matter of allowing yourself to be swept away (because how can you be with a book this physically heavy? ), but of making a conscious decision to begin a long journey in the rain. This, I think, is Catton’s intention. Her opening scene, set in 1866 Hokitika, New Zealand, finds young Walter Moody rattled from his overseas journey, bogged down by fatigue and rain. Upon entering the smoking room of the Crown Hotel, he comes upon twelve men silently occupying themselves in the kind of “studied isolation” that betrays the secret council in which they were deeply engaged just moments earlier. Both Moody and the reader must decide if the glimmers of intrigue that Catton has left visible are worth the trek into the murky unknown. The answer for this reader is yes. Though never an easy read, the weight of The Luminaries is one which begins to gain momentum the moment we know something another character does not (which happens repeatedly throughout). Catton is a master of both concealment and revelation, parceling out each in just the right amounts so that our confusion never quite overtakes our dawning understanding, and vice versa. Her style is one which assumes and speaks to the reader, and ultimately rewards them in the incredibly satisfying final chapters. Despite the mathematical and thematic sophistication of the book’s structure and Catton’s gorgeous, though occasionally high-falutin’, prose (the men in the Crown Hotel “might have been twelve strangers on a railway car, each bound for a separate quarter of a city that possessed fog and tides enough to divide them” their “bodily silence…deadened here not by the slur and clunk of the coaches, but by the fat clatter of the rain”), The Luminaries is, at its heart, a mystery story. Like any good mystery, the beauty of the language and the elegance of the chapter headings and divisions are secondary to the characters’ (and the reader’s) quest to seek out what is hidden and to unravel what seems at first to be hopelessly twisted. The prose and the structure, significant as they are, are the vehicles in which we travel–the mystery is the terrain. Luckily, The Luminaries‘ mysterious landscape is one the author has mapped well and one she is adept at revealing. Unlike the patronizing explanations of Sherlock Holmes, Catton’s facilitation of our understanding is as emotional as it is rational, as lyrical as it is illuminating, and as wistful as it is fulfilling. 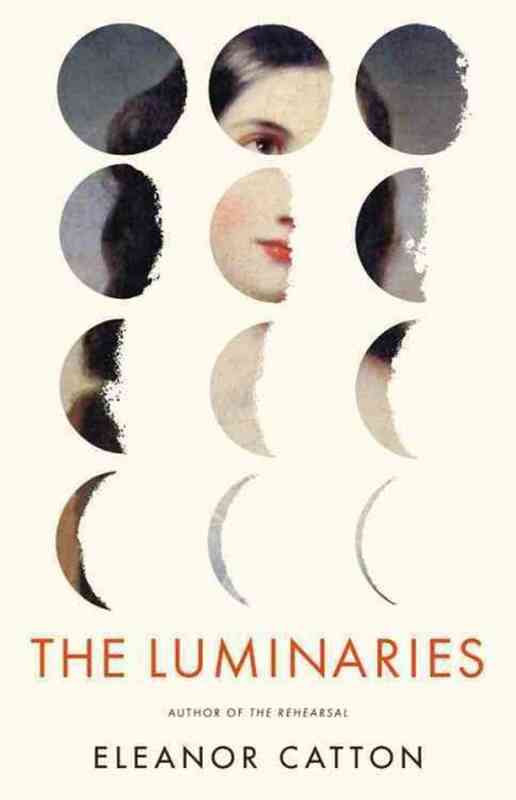 Having quite enjoyed The Luminaries, the only reason I wish the book were not so long is so that I would be more likely to undertake the repeated readings that would allow me to tease out Catton’s carefully crafted design a little more and derive even more pleasure from her skill. Even returning to the book casually (i.e. for leafing through) for the purposes of this review revealed details I hadn’t noticed before: delicious section names like “Tar”, “Tin”, and “The Widow and the Weeds”, and the way that the title of Part I, “A Sphere with a Sphere”, comes full circle (and becomes more poetic) for the book’s final section title, Part XII, “The Old Moon in the Young Moon’s Arms”. There is so much to notice in this novel and so much to take pleasure in that I hope The Luminaries’ size will not dissuade you. Eleanor Catton clearly laboured long and now has a triumph to show for it.